Dhan Dhan Guru Ram Das Ji speaks to us today through the Goojaree Raag, a very serious Raag. Raag Goojaree, mehalaa 4 - by Guru Ram Das Ji, fourth light of Guru Nanak, ghar 2 - to be sung in the second house. Ik oa(n)kaar - There is one eternal universal Creator of all. Sathigur prasaadh - who is found through the sath, the true Guru's grace. My soul only lives when I'm meditating upon You. When I don't, mar jaao - it is my spiritual death. So althought this love is like that of the child and milk, it is actually greater. That Waheguru Who is agam - beyond our reach, agochar prabh - The Lord Who is beyond our grasp, guramukh paaeeai - can only be found by becoming a guramukh, by following The Guru, by having your face towards The Guru at all times. Apunae sathigur kai balihaaree - I am a sacrifice, I am balihaaree, to my True Guru. Man rae - O my mind, har keerath thar thaaree. How are you going to thar, how are you going to cross across this ocean? 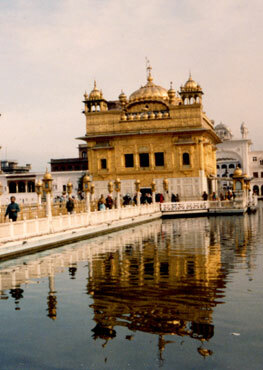 Har keerath, the keerath, the praise of Hari, of Waheguru is the boat, is your saviour to liberate you from this ocean. The guramukh, the one who follows The Guru is blessed. Paaeeai - means to find, find what? The jal - the water, of what? Naam a(n)mrith. The immortal nectar of Naam, of God's Name. Jin ko kirapaa thumaaree. Only those people find that, who have the kirapaa, who have the grace of Waheguru. Rehaao - Guru Ji says pause and think about this. Sanak sana(n)dhan, the sons of Brahma, the messenger of the God's naaradh, mun, the sage naaradh, the wise man, the one who is the messenger of God; saevehi - they all serve You O Waheguru. Banavaaree means the sustainer, the Lord of this ban, this jungle, this world. O Waheguru, they all, anadhin - day and night, japath - meditate, upon You. Prehalaadh the jan, Prehalaadh the servant, came into Your saranaagath - Your protection. Then what happened? Thin kee paij savaaree. Waheguru Ji You sorted out, You protected his paij, his honour. This story can be found again and again in Sri Guru Granth Sahib Ji. And we sing it every day as we sing Sodar before Rehraas. Again, that's a chhant in the Aasaa Raag by Sri Guru Ram Das Ji. Waheguru Ji saved Prehalaadh from the clutches of his father Haranaakhas when Haranaakhas was about to tear Prehalaadh open and kill him. Waheguru Ji came and saved him in the form of Narsingh, half-man, half-lion. You can read about this further in those shabads. Alakh - The One Who cannot be known by any intellect, nira(n)jan - That One Who is beyond the stains of this maya, of this material world, eaeko varathai - there is only one Waheguru Who is pervading through all. Eaekaa joth muraaree - That one light can be seen in all, of that muraaree - The killer of the demons of kaam, krodh, lobh, moh and ahankaar, Waheguru. Sabh - all, are jaachik - beggars. Everyone is begging, thoo eaeko dhaathaa, O Waheguru, You are the dhaathaa, The Giver, The only giver in this world. Everyone else keeps on taking and taking. Maagehi haathh pasaaree. We are all beggars, haath - our hands, pasaaree -to put your hands out, like a beggar putting his hands out to ask for alms. Everyone is putting their hands out and begging Waheguru Ji. Anamarriaa - the skinless drum plays. What is that drum, it's the drum within us, that is Waheguru playing inside, that is the speech. When you become one with Waheguru Ji like those bhagaths, jans, devotees, they speak His words, they speak of that unspoken sound, the unstruck current. Their janam - their life, is safal - is blessed. Thin kaeraa aap tharae kul thaaree. Aap tharae - they save themselves, kul thaaree - they save their whole kul, their whole family. The manamukhs, the people who follow their minds, they are in dhubidhhaa, in duality. Dhuramath biaapae, biaapae means to be attacked by, to be completely submerged in dhuramath. There is either guramath, The Guru's math, The Guru's wisdom, or there is dhuramath - dhur literally meaning bad, evil, and math meaning wisdom. That is what they are stuck in. Because they have the darkness of moh - of attachment to this world, to this maya, a(n)thar - within themselves. They do not bhaavai, they do not have any love inside, they do not like the kathhaa, the sermons, the speeches, the discourses of the sa(n)ths, of the saints. The guramukh liberates his own family, but what do these people do? They ddoobae - drown, and they take those around them with them, their paravaaree - their families. Why? Because the guramukh is going to encourage his family to meditate upon The Naam, but what is the manamukh going to do? The manamukh is going to say let us take our consciousness away from God, let us take drugs, let us drink alcohol; whereas the guramukh will say let us sit down and read Jap Ji, read Rehraas, meditate upon our Creator Lord. The ni(n)dhaks, the slanderers, by doing ni(n)dhaa - slandering, what are they doing? What is ni(n)dhaa doing? Mal dhhovai, its washing away the mal - the filth, of others. Ouhu malabhakh maaeiaadhhaaree. Sathiguru Ji says those people who do ni(n)dhaa, they are doing malabhakh, they are eating the filth of others. Mal means filth, bhakh means to eat. They are maaeiaadhhaaree, dhhaaree means orientated, maaeiaa means towards this material world. They worship this material world. Those people who do ni(n)dhaa, who slander, who make up gossip about sa(n)th janaa, about the saints, about the servants of Waheguru, they do not find any peace ouravaar - in this world, n paaree - nor in the next. This whole parapa(n)ch, this whole game, this whole khael, keeaa sabh, is all created by The Creator Waheguru, by karathaa purakh. That Hari Waheguru Who nourishes all That karathai, That karathaa purakh, That Creator, sabh - means all, kal means His shakti, his energy. He has infused into all. Throughout this while jug, throughout this whole world, there is eaeko - one, sooth - thread. There is one thread through the whole of this world and that is Waheguru. Sooth khi(n)chai eaeka(n)kaaree. When Waheguru Ji pulls out the sooth, the thread of life from all, and destroys everyone, then there is only eaeka(n)kaaree, then there is only one. Rasan rasan - with their tongues, what do the guramukhs do? Ras gaavehi har gun, they taste the sublime essence of har gun, of the praises of Hari, of Waheguru, and they meditate upon these praises, they sing them. With their rasanaa, with their tongue, they taste the har ras, the essence of Hari, of Waheguru, the sublime amrit ras of Naam. Naanak, O Naanak, har bin avar n maago, whenever you beg from God, whenever you do an ardas, Sathiguru Ji says to not beg for anything apart from Hari. Har bin, meaning without God, avar means anything else, n maago means do not ask. Do not ask for anything else, ask for Waheguru. Sathiguru Ji says I am in love with, I have preeth, I have love, I have piaar inside me for har ras, for that essence, for that sublime taste of amrit, of immortality, of God, of Waheguru. O my mind, praising Waheguru, meditating upon Waheguru is what will save you. May Sathiguru Ji bless us that we focus upon that, throughout this day and throughout every day of our lives.